If you’re a student who just landed an internship or part-time job, it’s time to think smart about money. 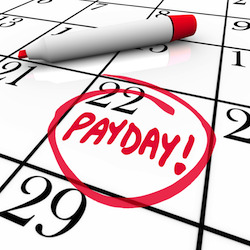 Those paychecks will begin rolling in, and having a plan to manage your money is essential. College is certainly the best time to begin healthy financial habits. For example, creating a budget and living within your means can have an impact on years to come. Start off on the right foot with spending and saving habits that will facilitate financial independence down the road. Creating a financial plan during your college years can keep your degree debt low. Let’s face it, financial aid doesn’t even scratch the surface when it comes to your degree debt after you graduate. Items to consider when budgeting your upcoming semesters are . . .
You can get a good idea of each item’s cost by talking with your financial aid office. The better you budget now, the less money you need to borrow, and the bigger the impact on your loan debt later. “Financial responsibility is one of the many skills students need if they are to be successful in college and life,” says Theresa Hitchcock, Director of Advising and Resource Center, University of Southern Indiana. You are new to financial planning, and you will certainly need to make adjustments to your budget as you go. However, it is important you stick to the budget you outlined. Your college budget is merely a learning opportunity. The first few semesters of budgeting all those college needs will be challenging. But always remember that you can make changes. Just like everyone else in or out of college, you will face some financial firsts that will be cause for adjusting your budget. Seek advice from parents or financial aid advisors, since they have all made budget adjustments multiple times in life. Balancing your budget is the most difficult part of learning how to be financially independent. This is even more challenging for those in college. “College is also synonymous with young people assuming a greater responsibility for managing their own money – away from the reliable security of mom and dad's wallet,” according to U.S. News. You will need to go with the flow and get crafty when it comes to spending habits. And you will be balancing your budget to fit your internship or part-time job as well. However, when it comes to saving a sliver of those hard-earned paychecks, college students have a few advantages for spending less. Student discounts. You can find a variety of stores on and off campus that offer student discounts. You can save up to 20 percent in some cases just by flashing your student ID. Keep textbook cost low. The digital era has created several ways for you to get buy cheaper textbooks, or in some cases, get them for free. Check Amazon for discounts and ebooks. You can even make copies as you go using the textbook on file at your university library. This could save you hundreds every year. Make saving mobile. One way to save more is to not even see the money. You can set up an automatic deposit from your internship or part-time paycheck to your savings account. If you set up a clear financial plan with a semester budget, you are on the right track to financial independence. And you may even find saving to be habitual. After all, who doesn’t like seeing more digits in their checking or savings account? Making a habit of saving can lower your school debt after graduation. Or you may want to put the paychecks from your internship or part-time job toward a study abroad program to further your academic growth. And if you are studying abroad in the U.S., you will find financial independence to be liberating so far from home. Financial independence certainly begins in college. You’re finally staking claim to your very own personal and professional growth in life. Your decision to take on an internship or part-time job is a good indicator of future success. But make sure you spend wisely. Dave Landry Jr. is a finance and marketing consultant for small business. He is a guest contributor and has appeared in business.com, workitdaily.com and other online resources.